Although there is no doubt that the one thing at the front of our minds in December is Christmas, you’d be excused for wanting a break from turkey and tinsel at least once this month. If that’s the case, you’ve come to the right place, as our writers are on hand to provide their top cinema picks. Having been lucky enough to catch an early screening of Boots Riley’s directorial debut at this year’s London Film Festival, I must admit I’m at a bit of an advantage in recommending it here. But take it from me, hindsight is a real beauty, because I can categorically confirm that Sorry to Bother You should be at the absolute top of your film radar this month (and everything we could ever dream a Boots Riley film would be). Set in an alternate California, the film chronicles the ins and outs of a bizarre telemarketing company where the top employees can become ‘power callers’ and thus uncover the business’ deepest and dirty secrets; yep, it’s certainly as strange (and wonderful) as its premise sounds. The superb cast, including Lakeith Stanfield, Tessa Thompson and Terry Crews, should alone be enough to get you straight to the cinema. And just wait until Armie Hammer’s cameo really gets going, making the final third of Sorry to Bother You possibly one of the most sensationally outrageous segments to ever grace our screens. If anything is going to distract you from the hellish task of Christmas shopping, it’s this raucous comedy. At face value, Mortal Engines threatens to be another in the long line of post-apocalyptic teen dramas. Below that surface, however, is what could be a breath of fresh air for the genre. Following lead character Tom in a future where cities exist on wheels on a depleted earth, the film’s premise seems unique for the big screen and perfect for release during the season of festive entertainment. With Peter Jackson at the writing helm for this book adaptation and his Lord of the Rings collaborator Christian Rivers making his directorial debut, there’s some serious talent behind Mortal Engines. Most exciting of all is combination of stars Hugo Weaving and Robert Sheehan; something about this project must have caught their eye, suggesting that this adaptation could be everything fans of the successful book have been waiting for – let’s just hope Jackson and co. have kept faithful enough to the book to keep the fanboys at bay! Spider-Man has been a constant feature of the pop culture landscape for the last fifty or so years, with his recent addition to the Marvel Cinematic Universe and a critically-acclaimed video game raising his profile ever further. But the version we all know, Peter Parker, the plucky high schooler from Queens, isn’t the only Spider-Man. 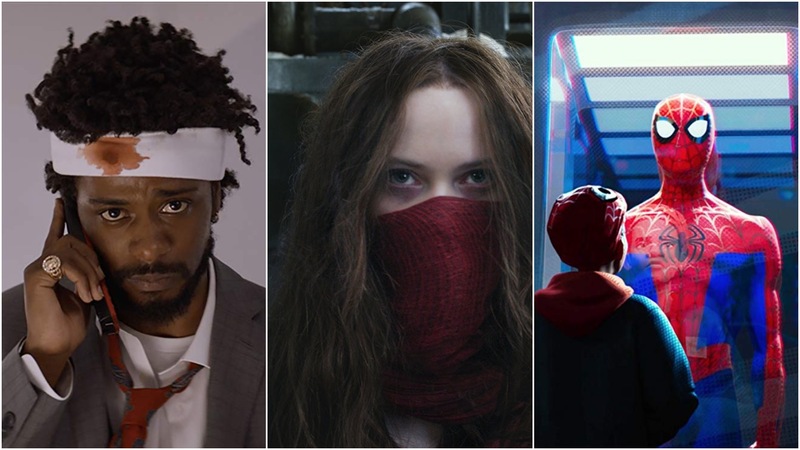 Spider-Man: Into the Spider-Verse promises to shine a light on the alternate takes on Spidey, some familiar, some far-out, that have graced the pages of Marvel Comics over the years. At its centre, Miles Morales, a teen much like Parker, struggling to juggle everyday life with superhero responsibilities, but with a notable difference – his half-Puerto Rican, half-African American heritage. With a stunningly fluid animation style, Phil Lord and Christopher Miller producing, and a voice cast that features Nicolas Cage as Spider-Man Noir and John Mulaney as Spider-Ham (right?!? ), it seems certain that Into the Spider-Verse will bring a unique and refreshing interpretation on the Spider-Man story. Film Studies student. Enjoys classic Simpsons, R.E.M. and the MCU.